It is seldom that I come to a building that not only makes me think ‘yup, tick, they have all the environmental aspects right’, but think ‘wow this place sings’. I get emotional about the Venny and do every year when I take my students there. It isn’t living building certified, it was built before LBC was a consideration, so it probably has most of the red list in it and doesn’t have the verification systems needed… BUT… boy does it live. 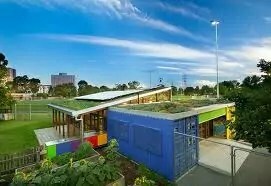 The Venny is a staffed communal backyard and adventure playground facility located in Kensington, Melbourne. This project was built to support the local high density, low socioeconomic neighbourhood, with a communal backyard and child support services. The Venny has been designed to make use of its context and life off the income of its site, as such it produces surplus energy and water, it is designed with passive lighting, heating and cooling strategies and it is made of recycled shipping containers. The clubhouse is made of 5 refurbished shipping containers forming a U shape, creating a large column-free activity space. Each container has the added benefit of being able to be closed off offering programming flexibility. The space in between is the communal space with a concrete floor and trussed cathedral ceiling. There are embodied impacts in the concrete used, the roof trusses in the central area, the fittings and so forth, but these will be paid back through the excess energy production. The building has a green roof designed to be accessible to the children and providing eco-services such as providing habitat, insulation, cleaning the air and slowing and treating stormwater. No toxins were used in the development as far as the project team could discern and the building was designed with as much recycled materials as possible. The playground has a vegetable garden, chickens, ducks and the children regularly eat the produce. To use a term Janis Birkeland uses in her Positive Development approach, this building is an example of increasing the public estate. It increases the public estate by being a building that overtly demonstrates its environmental credentials and this is crucial especially for the young where it fosters an ability to recognise and adopt these practices in their everyday lives[i]. In a recent study of four education facilities, Higgs and McMillan[ii] found that daily exposure and interaction with sustainable designs and strategies helped promote both learning and adoption of sustainable practices with children. The concrete floor has the highest environmental impact of this project, but it is an investment that has been made mindfully. 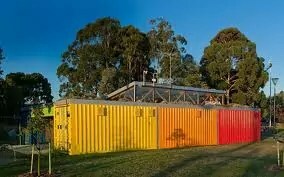 This was the only location where thermal mass could be embedded to take advantage of Melbourne’s diurnal swings as a result of using the recycled containers. Yet, the floor has a much more important story to tell, one that is worth the investment in its permanency and embodied energy. It embodies the history of the Venny and its operation over the last three decades. The children that the Venny caters for come from often stressful home environments, the Venny is a safe place to be, to explore, learn and play. When the decision to demolish the old facilities and move them was made, the staff where very concerned about the stress that this would add to their charges. To address this a 12 month process of consultation with the children and Venny staff was undertaken. They shared with the designer what they loved about the old Venny and what they wanted for the new building. In short they wanted to save the walls, floor, ceiling and door; everything. In response to this the staff, architect and children started to capture ‘loved elements’ which were embedded in the new floor. They made models of the old building, drew, painted, made prints, and wrote stories about the Venny. The floor became the holder of this history. For me one of the most powerful stories told to me by one of the staff, it was about one of their boys, a boy with a lot of problems and stresses in his life, and his reaction on coming into the new building. “He came in with an attitude of distrust, he took two steps, went quiet, then sighed and laydown on the floor arms spread wide. He was hugging the photograph of the old Venny door, which had been embedded in the floor at the entrance, complete with all the locks that kept them ‘safe’”. This is the second aspect of the Venny, it is adding to the public estate, through the process of its design and development the vulnerable occupants were taken on a journey, their wishes integrated and their hearts protected. Respecting these disadvantaged little ones, consulting them and being their partner through generosity of time and engagement, that to me is the most contributive lesson from this project. The playground, the building, the staff and the activities planned are all centred on supporting at the risk social housing families to be able to play, learn, interact with nature, each other and become part of the community. Many of the families living in the target group have recently arrived as refugees or have suffered other hardships. The children in their apartments do not have a backyard to play in, they have no ability to access a place to grow food, keep chickens, build cubby houses, and so forth. Yet it is these things that research shows are imperative for the balanced development and a healthy mind and body. Adventure Playgrounds provide the means for positive risk development and healthy lifestyle choices[ii]. Part of that development is the ability to take risks, to learn about one’s physical limitations. In recent years, there has been increasing concern that society’s preoccupation with safety and the elimination of risk is having a detrimental effect on urban children[iii]. Rather than learning how to assess and deal with risk through learning, children become accustomed and reliant on risk being managed for them, and are ill equipped to recognise risk themselves. Finally, what the Venny shows is that it is possible to design for both social and environmental benefits, and although the integration of design and nature is not as evident as it could be, the project demonstrates many aspects of the contributive approach to design and development that LBC and the LFIA are about. The staff and children were integral to the development process, the environmental context was carefully considered and the ecosystems implemented mean the project is in continual development and evolution. [i] Kellert, S.R. (2005). Building for Life: Designing and Understanding the Human-Nature Connection. Washington, DC: Island Press, p.77. [iv] Adams, R. 2012. Taken from presentation; University of Melbourne, Planning Urban Sustainability, ABPL90064, Seminar 5, Semester 2, 2012.